Stems: Erect, simple or branched, stiff, rough, angled, minutely pubescent. Leaves: Lower opposite, upper mostly alternate, stalked, palmately compound; leaflets 5-11, linear-lanceolate to lanceolate, 1.5 to 6.5 inches long, .1 to .8 inch wide, center leaflet longest, outer leaflets progressively shorter; surfaces rough above, pubescent below; margins toothed; tips tapering to points. Inflorescences: Panicle, narrow, staminate, terminal or clusters, small, spike-like, pistillate, in upper leaf axils. Flowers: Small, greenish; petals absent; staminate and pistillate flowers on separate plants (dioecious); staminate flowers on stalks; sepals 5, lanceolate to ovate, less than 1/6 inch long; pistillate flowers sessile, partially enclosed by sepal-like bracts. Fruits: Achene, nearly spherical, about 1/6 inch long, yellow to greenish-brown, 1-seeded; seeds oval, mottled brown. Habitat: Waste areas, ditches, pastures, low ground along streams, and roadsides; shaded and exposed sites; moist, fertile soils. Origin: Marijuana is native to Asia and has been cultivated for more than 8,000 years. It was introduced into the Great Plains during the 1880s and is now naturalized. Forage Value: No forage value for livestock. Quail, pheasants, songbirds, and small mammals eat the seeds. Uses: Marijuana was formerly grown for hemp fiber which was used in the production of rope, nets, and paper. Comments: Marijuana contains tetrahydrocannabinol, a chemical with narcotic properties. 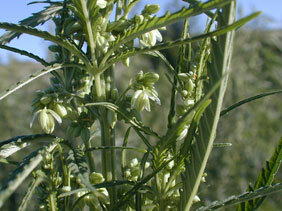 It has been declared a noxious weed in many states. The pollen of marijuana can cause allergy symptoms.